The seasonal pond behind the house is drying up fast. 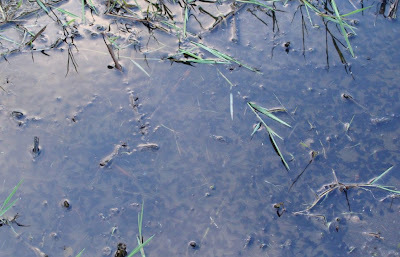 It is packed with gasping tadpoles. Last year I took bucket loads of tadpoles up to the other pond when this happened, but I'm not going to this year. If these frogs are stupid enough to reproduce in this pond, then I really feel that natural selection should take its course. 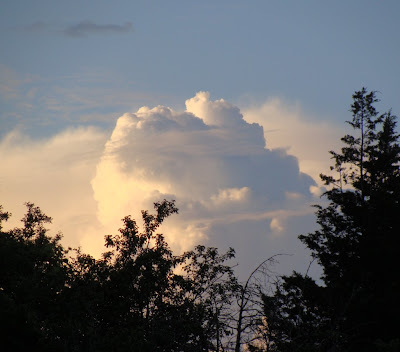 There are some impressive cumulonimbus clouds around tonight, though, so with any luck they will produce some rain to add to the utterly measly 5.2mm (0.2 inches) of rain that we've had in June so far. Loved that cloud picture girl ! Yes!!! Whichever god it is that reads blogs sorted out another 5mm of rain for us early this morning, so the tadpoles have a stay of execution, thank goodness. Would still like a little bit more rain though, if that could be arranged. Pretty please. Looks like we got that rain and then some! Simon wants to come play with Max RIGHT NOW...he really loved your son. Hope to connect in the future!